This original musical revue includes scenes, songs, and choreography from Broadway musicals, films and popular culture, all around the theme of friends and friendship. Featuring songs such as “Friend Like Me (Aladdin), “For Good” (Wicked) and of course “You’ve Got A Friend in Me” (Toy Story), this theatrical montage will explore new friends, old friends, loyal friends and wacky friends in a joy-filled production! The Addams Family young@part is the smash-hit magnificently macabre musical comedy that brings the darkly delirious world of Gomez, Morticia, Uncle Fester, Grandma, Wednesday, Pugsley and, of course, Lurch to spooky and spectacular life. Come join the family! We’ll leave the lights off for you. Theatrical Outfit solidified its commitment to theater education for youth with the inaugural season of SummerStage at the Outfit in 2015. By the following year, enrollment had doubled for this four-week summer program which emphasizes skill building, musical theater production and love for the art form of theater. 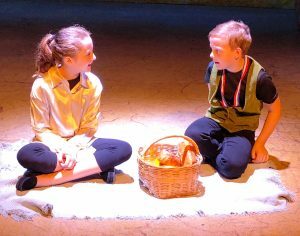 Our philosophy of theater education begins and ends with a focus on story. Everything we teach, everything we model, everything we practice is centered on the idea that clear and inventive communication between actors and audience of a given or devised story is what makes theater “work.” All of our instruction – be it in blocking, scene creation, character development, choreography, vocal work, design or improvisation – is rooted in this simple yet crucial idea. Additionally, we place a high value on ensemble-building in both our camp and workshop environments. The camaraderie that exists amongst our students is extraordinary and largely derives from the emphasis we place on ensemble building, mutual respect and a shared love for the creative process.